Despite having a winter break, the Italian Serie A never seems to stop providing drama for its fans as the latest news from the media stated that Inter Milan are preparing to sack their new coach Rafael Benitez regarding the success the Nerazzurri had in the Fifa World Club Champions. According to reports from Italy, the former Liverpool’s coach latest statement requesting for more support for his club has angered the team’s management especially owner, Massimo Morrati. Although there’s no final confirmation as just yet about Benitez’s status the press seems certain that the Spanish born tactician will not be sitting on Inter bench again after the new year especially after Moratti obviously felt offended by the coach’s previous statement. 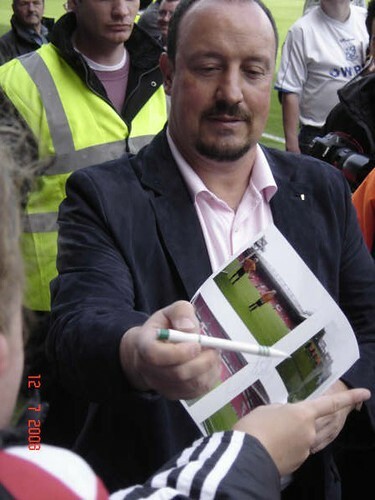 Although he hasn’t said anything regarding the former Valencia coach’s future, the President’s dissapointment was obviously seen from his statement commenting on Rafa’s ultimatum. The calm gestures from the patron doesn’t bring down the fact that Benitez’s outburst has caused damages for Inter as the Spanish tactician were stating about promises the club haven’t fulfilled and also pushing the Nerazzurri to give him three new players in January or sack him. Those rather arrogant words that came right after the Italian giant succesfully won the Club World Cup turned to back fire at Benitez as reports even claim that his players werent ammused with their coach’s bold statement. The tactician himself has been under fire lately as he hasn’t been able to make Inter performing well in the League and also the last few games in the Champions League, the result in the Fifa Club World Cub is being said as Benitez’s last resort in keeping his job but things seems changed after that statement. Surely the tactician probably felt a little bit emotional after winning a trophy and aiming to shut down critics about his ability but just like Moratti stated, the timing was inappropriate and kinda of unprofessional coming from a respectable coach. The former Liverpool coach may have been a little bit distracted by the critics he received just before goint into the Club World Cup and emotionally reacted with that ultimatum after getting a success with Inter. However, considering the fact that all that he stated is not an appropriate words to say outspokenly outside of the club, sacking seems like a certain move that will probably be done soon although things can still be turned around.